Jon Stewart had a segment on his show this detailing why the Republicans were blocking the confirmation of Dr. Vivek Murthy for the post of Surgeon General.- Daily Show – America Stands it’s Ground. The source of the issue came from the NRA and Senator Rand Paul who started a campaign against the confirmation of Dr. Murthy. The crux of this is NRA’s apprehension that Dr. Murthy’s outspoken views on “sensible” gun control which in fact are not that radical and in line with what most Americans want, from a reform perspective. So then why IS the NRA worried about this specific nomination to the point that their campaigning has caused the White House to put a halt on the nomination till the elections are completed? The answer as “control”. 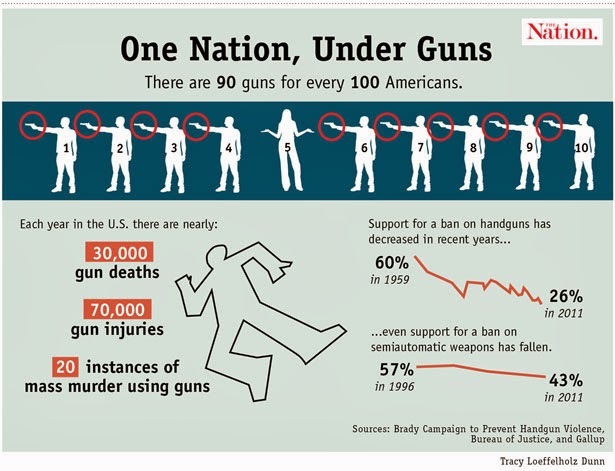 The NRA has been very successful in advancing the “fear” propaganda. Guns are safe, there are a myriad of unseen terrors lurking that can get us and being armed is the best recourse for our personal safety. In addition they have been very successful suppressing data on gun violence. The Second Amendment provides the right to bear arms and this has been debated ad nauseum regarding the historical relevance of the Amendment. If our forefathers had the “fore”sight that a person, 225 years later would be able to go on the web and buy an AR-15 maybe they would have done a double take on the “right to bear arms” amendment. I get that you need guns to hunt but c’mon semi automatic and sophisticated handguns? These are the same nut jobs that need to buy a Hummer – since the terrain from the gated community to the super market is like Fallujah. a) It is protected by the constitution – Fine. No argument there. 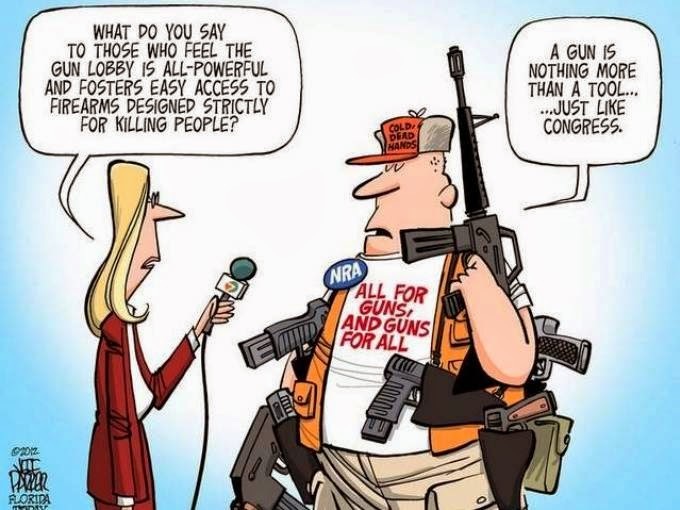 b) Guns don’t kill, People do – really? that is a viable argument? So if the gunman in the Newtown, CT killings had a bunch of knives (and killer ninja stars) he would be able to kill those poor innocent children at the speed, that he did? c) I am a law abiding gun owner and I should have the freedom to own the guns I want – That is circular logic. If it has been proven via data and polling that there are certain types of guns (if regulated) will greatly reduce the number of violent gun crimes, isn’t a little bit of sensible regulation good? So what is the solution. It is not attacking the NRA as the boogieman. The NRA is a non profit organization and lobbyist. It is protected by the First Amendment and should be commended for their effectiveness in driving the gun ownership agenda in this country with a maniacal focus. The obvious answer then becomes our elected representatives doesn’t it?. 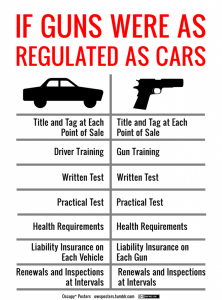 Here is Obama’s proposed Gun Control measures that were put together post the Connecticut Mass Shootings.Universal Background checks and Assault Weapon Bans are really items that the Congress can do to positively influence gun crime. But that is not happening anytime soon. And that brings us back to our circle jerk. As Jon Stewart states in his segment, Dr. Murthy is standing for the nomination of Surgeon General – best he can do is put warning labels on bullets! Lobbyists will lobby that is what they do. There must be a greater conviction amongst our elected officials to be pragmatic, rational and logical. Else we are doomed. We can’t let the rhetoric crackpots influence elected officials. You know the folks that traverse this arc on a minute by minute basis – Freedom->Guns->Greatest Country->Liberty->God (I know I am missing a few more from the Fringe Bingo Card). – Appointing or Not Appointing Dr. Murthy based on his experience and qualifications for the position – not because of his views on gun control? – Passing sensible gun control regulations like background checks and assault weapon ban? I don’t know…time will tell. Common sense is not so common these days! Next Article You got to have Faith! Faith!